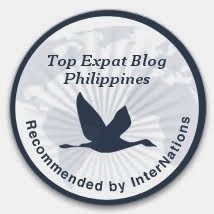 This might not be the typical expat blog, written by a German expat, living in the Philippines since 1999. It's different. In English and in German. Check it out! Enjoy reading! Dies mag' nun wirklich nicht der typische Auswandererblog eines Deutschen auf den Philippinen sein. Er soll etwas anders sein. In Englisch und in Deutsch! Viel Spass beim Lesen! You plan to move to the Philippines? Wollen Sie auf den Philippinen leben? There are REALLY TONS of websites telling us how, why, maybe why not and when you'll be able to move to the Philippines. I only love to tell and explain some things "between the lines". Enjoy reading, be informed, have fun and be entertained too! Ja, es gibt tonnenweise Webseiten, die Ihnen sagen wie, warum, vielleicht warum nicht und wann Sie am besten auf die Philippinen auswandern könnten. Ich möchte Ihnen in Zukunft "zwischen den Zeilen" einige zusätzlichen Dinge berichten und erzählen. Viel Spass beim Lesen und Gute Unterhaltung! Deutsche Sprache in Davao City! German Language in Davao City! Sie müssen auf den Philippinen DEUTSCH lernen? 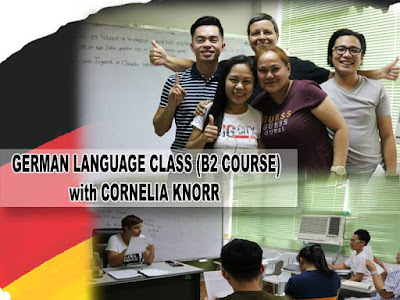 You have to learn the German language in the Philippines? You are a nurse? Sie sind eine Krankenschwester/ein Krankenpfleger? Sie wohnen in Davao oder irgendwo in Mindanao oder sonst wo auf den Philippinen? Do you reside in Davao City or somewhere else in Mindanao or the Philippines? Hier können Sie am besten sehr gut Deutsch lernen. Und zwar nur HIER! 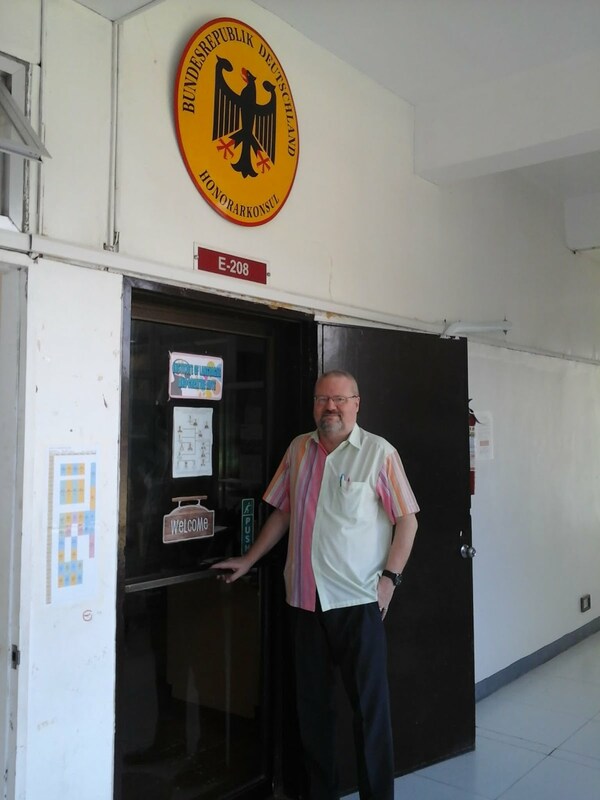 Mein Deutschkurs als Professor zusammen mit 2 weiteren "native speakers" am Institute of Languages (Fremdspracheninstitut) an der University of Southeastern Philippines in Davao besteht bereits nunmehr mehr als elf Jahren und bietet die fundierte Ausbildung, die benötigt wird, um das A1/A2 - aber auch die B1 und B2- Examen beim Goethe Institut in Manila bestehen zu können. 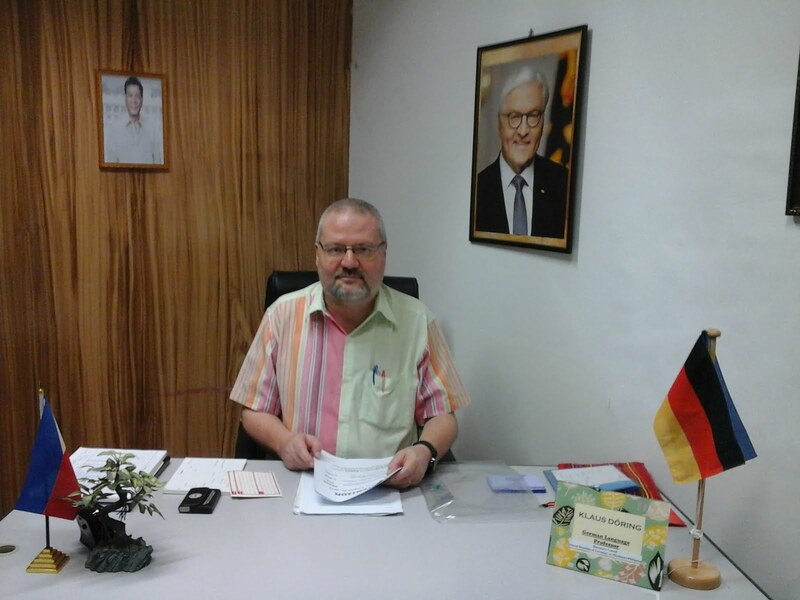 Das Goethe Institut Manila und USEP haben bereits vor 11 Jahren ein Memorandum of Understanding zur Förderung der deutschen Sprache und Kultur unterzeichnet. Alle Kurs-Teilnehmer erhalten ein Universitäts-Zertifikat mit Abschlußnote. Dies ist wichtig für eine spätere Visaerteilung! 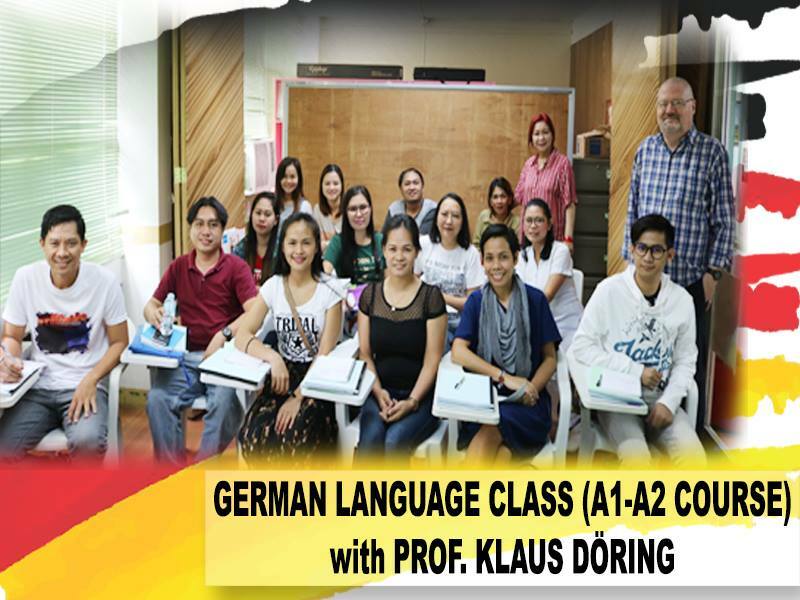 - My German Language Course together with 2 more native German speakers at the University of Southeastern Philippines in Davao City (International Institute of Languages and Creative Arts) as Professor (since more then eleven years now!) provides you with the requested education. You will be able to pass the A1/A2-exam (or even the B1/B2 exam at the Goethe Institute in Manila). Eleven years ago, the Goethe Institute and USEP signed a Memorandum of Understanding regarding German language and cultural support. Language Course Students will be receiving an university certificate with average grade at the end of the course. This certification is important for a visa application for Germany! Rufen Sie JETZT an: DAVAO 082 - 227 1761. Please call DAVAO 082 - 227 1761. ODER/OR 0915 - 2199002. 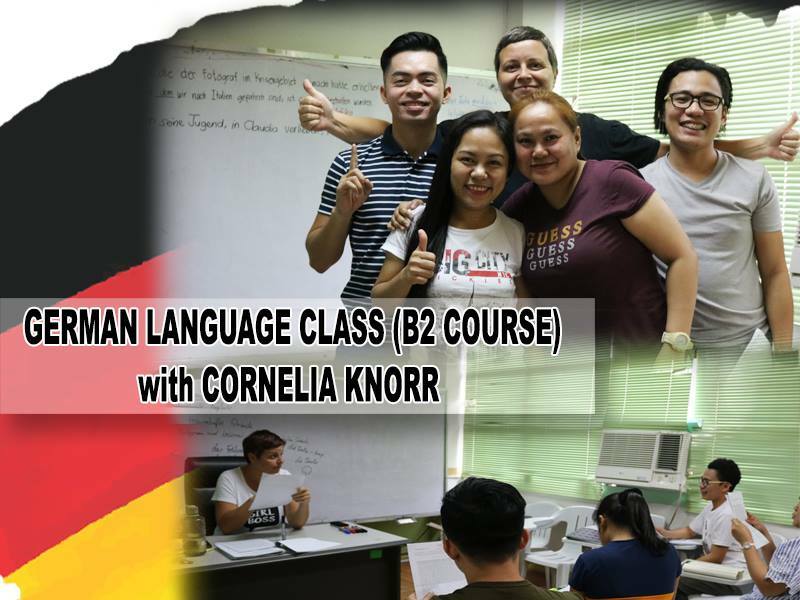 GERMAN LANGUAGE COURSES A1 and A2: 120 hours with the following schedule: Mondays, Tuesdays, Wednesdays and Thursdays from 9:30 till 11:30 AM. Limited 15 seats only! New course started already April 1, 2019. Call us now for empty slots also for B1/B2 courses with native speaker tutors and next A1/A2 -course starting July 25, 2019. Deutsche Sprache-Kurse A1 und A2: 120 Unterrichtsstunden: montags, dienstags und mittwochs und donnerstags von 9:30 bis 11:30 Uhr. Begrenztes Platzangebot: nur 15 Teilnehmer! Der neue Kurs hat am 1. April beginnen. Rufen Sie JETZT an für den folgenden A1/A2 Kurs ab 25. Juli 2019. B1/B2 hat ebenfalls am 1. April 2019 begonnen. FOR MORE INFO (ESPECIALLY DIFFERENT LANGUAGES COURSES) / FÜR weitere INFORMATIONEN (SPEZIELL BETREFFEND VERSCHIEDENER SPRACHKURSANGEBOTE) BESUCHEN SIE BITTE/PLEASE FEEL FREE TO VISIT http://www.usep.edu.ph AND THEN CLICK "MORE" and look for "Institute of Languages and Creative Arts" or follow me/us in Facebook. EHEANNULLIERUNG AUF DEN PHILIPPINEN? Marriage annulment in the Philippines? CONTACT US NOW! Kontaktieren Sie uns JETZT! YONNEX Translation and Documentation Services, Inc. Davao City/Mindanao only . The only registered agency in Mindanao: Business Permit Plate No. 39803! during office hours - während der üblichen Buerozeiten! Everyone is different. For some, Sunday is a day to relax, to unwind, to steam off, to belch out the heavy burdens of the mind and the heart - breathing space in between weeks and weeks of hard work. That is why people fill up the streets, crowd the parks, and the beaches on Sundays. The disco and the pub houses, the eateries and -mostly- the shopping malls make good money on this day. It's a day of Gold. The loss of some is the gain of others. Though most enjoyable, Sunday at the same time is a dangerous day. Since it is here where people come together, and it comes only once in seven days, a certain spirit of freedom and merriment pervades during that day. That is why in our 'celebration', we can't avoid jostling one another, rubbing our shoulders against other's shoulders and in the process, friction is produced that can destroy the gaiety of this most blessed day. 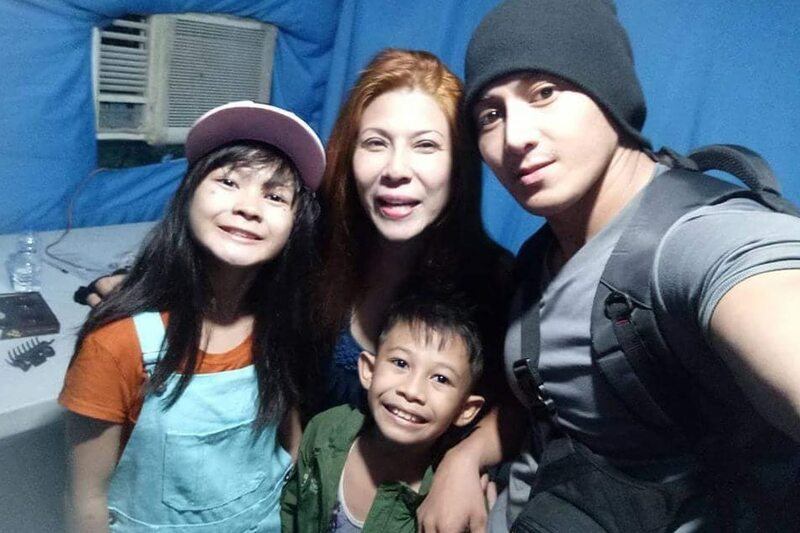 Sayang kaayo! Taking advantage of this short day of 'freedom', we sometimes lose control of ourselves, our senses especially out tongue, the most dangerous part of our body. I wrote already about it in previous columns at this corner. Yes, the tongue can incite, divide and hurt. The tongue is oftentimes the author of distrust, and suspicion leading to isolation and non-communication. Now is the end of friendship. While the tongue can praise, worship and give honor, it is amazing how much harm it does in just one day. Sunday - the day of the jackal? Sunday is a day first for others; secondly, only for 'me'! Yes, there are zealous people out there, who want to put their free day into good use with a noble purpose. It is a day to visit and cheer up the patients in the hospitals; the prisoners in jail; a day to learn more - another language, bible, piano-playing, cooking lessons. And at the end of the Sunday, these lowly lives sigh, "Day-off nga, lalo namang pagod". Yes, some don't feel well, but the desire being on service is enough reservoir of strength. Others almost find no time taking some food but the satisfaction and the fulfillment is beyond measure. 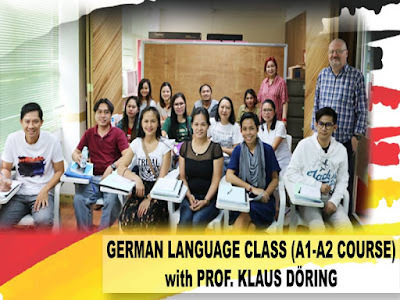 I learned this many times especially from my nurse-students: Learning the German language while still being on duty in several hospitals in Mindanao. Sunday is actually the Lord's day - but only "if and when I have some time left over". There are many who do not go to church because they say, "Lalo lang akong magkasala." They claim seeing in the church the 'chismosas', the "pintaseras', the 'mayabang', the 'supladas' and the 'mapagkunwari'. But they should not fail to see the good people in the church - and there are still a lot of them in there. And besides, why go and look for the bad instead of seeking the good? But granting that you and I are the cause of scandal, we ought to reflect very, very seriously and be ready to accept reality even if it is hurting our pride and self esteem. No one can search and arrive at the truth of our hearts but us. No one can change us without our humble consent and total submission. Everyday is the Lord's day in the hearts of the lowly, the simple and the humble. To die is to live! We are always shocked when in the middle of our surroundings, somebody passed away. Since last week, I was informed, that three countrymen of mine passed away. Our usual questions are: "Why die so young? Why he, why she?" A natural reaction, indeed. Also this year, I keep in mind: when Jesus finally gave up His spirit on the cross after three hours of bitter agony, the Pharisees said: "Finally, that impostor has gone. He deserved to die that kind of death!" Let's remember: After the waving of the tree branches by the Jewish crowd and Hosannas of Palm Sunday, the arrest of Jesus betrayed by Judas in the Garden of Olives, the imprisonment and humiliation of Holy Thursday night, the carrying of the cross, crucifixion, and death at Good Friday, - Jesus Christ rose from the tomb on Easter Sunday - glorious and will never and die again! For Jesus, dying was not the end of everything. It was the beginning of new life. Symbolically, we see that Easter Resurrection of our Lord depicted in various ways, which always point to life after death. Especially in parts of the world, i.e. in my home country Germany, where deep winter let all plants and trees "sleep" for a couple of months, people enjoy the spirit of the new shoots that come out of a big trunk of a tree. 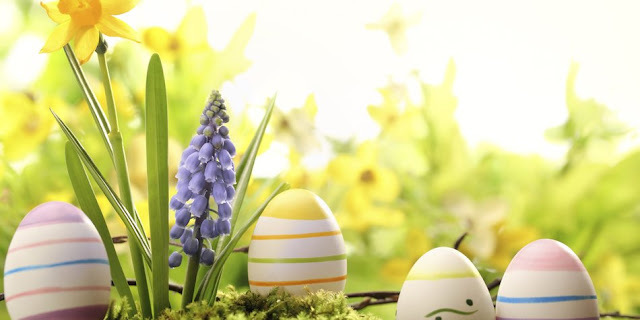 Eggs were usually symbols used in spring time long before Christianity came into existence. The eggs symbolize life, which its causing to grow. Since Easter usually occurs at spring time (March or April), which is already summer in the Philippines, this egg-symbol was still in the use among the pagans of early times when Christian were celebrating Easter. This year 2019, especially during Holy Week, I'll be taking a rest while hiding myself at my favorite beach resort. Somewhere out there... .
Before I go: a blessed Easter to all of you, my dear readers. Walk this time with great confidence in your heart, mind and soul. God bless each and everyone of you. And, yes, enjoy your egg hunting with your loved ones...! The Philippines is part of South-east Asia geographically. But many Filipinos feel a closer attachment to the West. Are Filipinos Asians or Pacific Islanders? Is the Philippines part of South-east Asia, Oceania or the Pacific Islands? Officially, of course, Filipinos are categorized as Asians and the Philippines as part of South-east Asia. But describing Filipinos as Pacific Islanders isn’t necessarily wrong either. In fact, for a long time, Filipinos were known as Pacific Islanders. What would have happened if the country hadn’t been united? Luzon, the largest island in the north of the Philippines, could have become a territory of China or Taiwan, while Mindanao in the south could have become a province of Malaysia or Indonesia. The formation of a bigger nation state composed of the Philippine Islands, Taiwan and parts of Malaysia and Indonesia could have been another possibility.They might well have been referring to the geographical distance of the country from mainland Asia. Composed of more than 7000 islands, the Philippine archipelagic state was a political creation of Western colonizers. It was Spain during the 16th century that united the major islands of the Philippines—if it hadn’t occupied the islands, the Philippine nation state wouldn’t have existed. Philippine society evolved differently from other Asian nations. For example, the Philippines (aside from Timor Leste) is the only Christian-dominated nation in Asia. The blending of Western and native cultures created a unique society that’s neither Western nor Asian. Many Filipinos are unsure about their identity and although they believe they’re Asians, many also feel closer to the West, especially the United States. Indeed, they seem to be prouder of their Western upbringing than their Asian identity. This colonial mentality has been identified as one of the negative traits of many Filipinos. South-east Asia is defined as a purely geographical concept in the Philippines and Filipinos often don’t appreciate nor understand the cultural and religious practices of their neighbours. They’re also unaware of Indochina politics. The Philippines was used as a launch pad by the United States during the Vietnam War. But while panic swept the rest of the region when Cambodia and Thailand almost went to war over a border dispute, the Philippines didn’t express any sense of alarm over the situation. To Filipinos, their place in South-east Asia is just an accident of geography. This is unfortunate, because the Philippines’ detachment from mainland South-east Asia could have been maximized to exert political leadership in the region. By not being involved with the numerous squabbles in Indochina, the Philippines could have played the role of objective arbiter in the various regional conflicts and disagreements. But Filipinos seem to be more interested in political events in the West. Instead of ignoring their neighbours, Filipinos should embrace their connection with South-east Asia. Öberzähne von Homo luzonensis CCH6. Die Menschheit ist um eine Art reicher: Homo luzonensis heißt ihr neu beschriebener Vertreter. 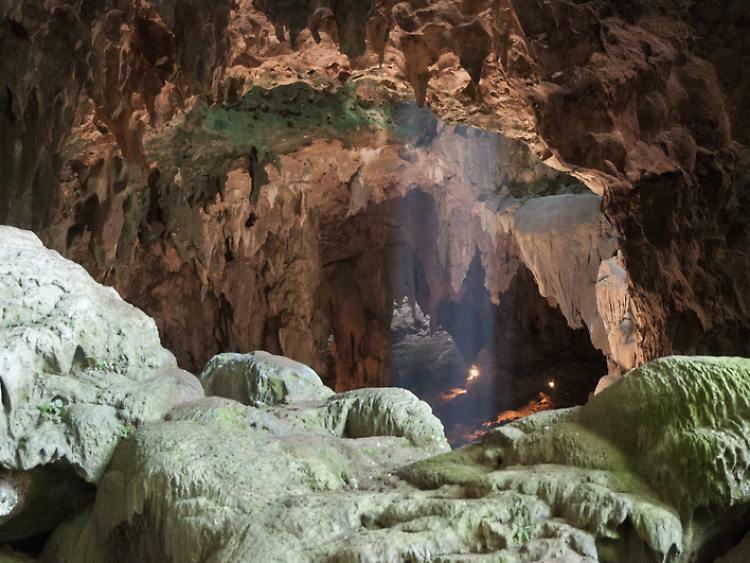 Überreste des Frühmenschen waren auf der philippinischen Insel Luzon in der Callao-Höhle entdeckt worden. Die Zähne und Knochen weisen sowohl Merkmale des modernen Menschen Homo sapiens als auch des Vormenschen Australopithecus auf, berichten Forscher in der Fachzeitschrift "Nature". Callao-Höhle auf Luzon - hier wurden die Fossilien des Homo luzonensis entdeckt. 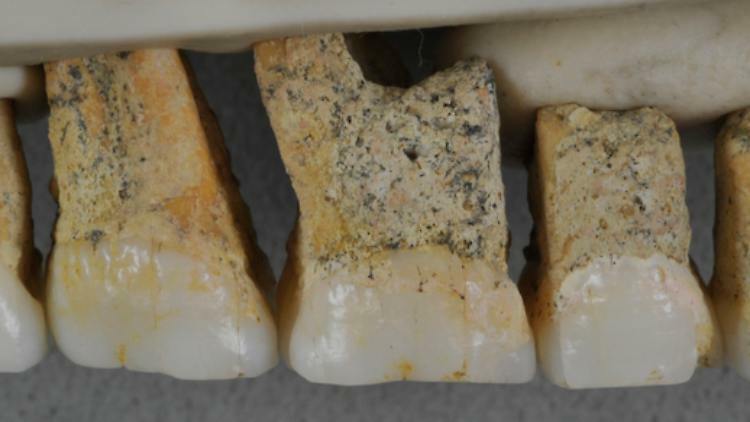 Gebogener Fußknochen des Homo luzonensis CCH4. In einem Kommentar in "Nature" nennt Matthew Tocheri von der Lakehead University in Thunder Bay (Ontario, Kanada) den Fund eine "bemerkenswerte Entdeckung eines menschlichen Verwandten, die in den kommenden Wochen, Monaten und Jahren zweifellos viele wissenschaftliche Diskussionen auslösen wird". Tocheri mutmaßt, dass Homo floresiensis und Homo luzonensis beide Nachkommen von Homo erectus sein könnten, die sich auf ihren jeweiligen Inseln über Hunderttausende von Jahren getrennt entwickelt haben. Auch Faysal Bibi vom Naturkundemuseum in Berlin vermutet in der Isolation durch die Insellage den Grund für die eigenartige Entwicklung von Homo luzonensis. "Wären die Knochen auf dem Festland gefunden worden, wäre das für die Wissenschaftsgemeinde ein Schock." Bibi verweist auf zahlreiche endemische Arten von Säugetieren auf Inseln, die schon vor Hunderttausenden von Jahren vom Festland getrennt waren. Sie weisen oft das Phänomen der sogenannten Inselverzwergung auf: Die Körpergröße nimmt über Generationen hinweg deutlich ab. Endemisch werden Arten genannt, wenn sie nur in überschaubaren, abgegrenzten Regionen auf der Erde vorkommen. Jean-Jacques Hublin vom Max-Planck-Institut für evolutionäre Anthropologie in Leipzig hält einen eigenen Artnamen für den entdeckten Frühmenschen für berechtigt: "Die Knochen und Zähne dieser Menschen unterscheiden sich vom allem, was wir kennen." 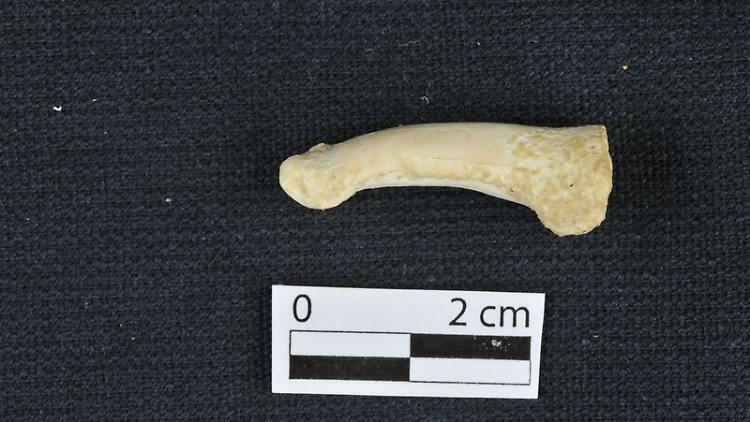 Ihn wundert auch nicht, dass sich die Entwicklung der Gattung Homo durch neuere Funde immer vielfältiger darstellt: In 1,5 Millionen Jahren hätten die Nachkommen des Homo erectus eine viel größere Diversität entwickelt als der Homo sapiens in den letzten etwa 100.000 Jahren, nachdem er Afrika verlassen hatte. Once upon a time, when I was still single: I woke up early morning. I got into the kitchen longing for a cup of coffee or even two, while feeling this terrible rheumatic pain. I slide a a cup of water into my ten-year-old microwave. I felt a little bit chagrined because I never figured out how to use it other than heat water for instant coffee of a one-minute-fast-food soup. Some time later: My freezer showed its red emergency light a couple of days. I tried to ignore it even knowing that this indifference could only let that problem become more worst. A friendly neighbor, a really blessed high-intelligent electrician, solved the problem within a minute. Another example: In the car I fumbled with the new digital radio. Before I know it, I'd tilting sideways at a 45-degree angle, trying to drive and figure out the radio's numerous controls at the same time. I know, this was more than dangerous: an urgent, uncomfortably close horn jolted me upright. Chastened, I only managed to turn the radio off and drove in silence. Do you know how to operate your telephone unit in the office, if you urgently have to transfer a wrong-dialed incoming long distance call to the right person and his local number? No call forwarding available...!You have been using the system for a year or even longer, but you have never mastered the transfer function. "Just a moment please, hang on," you say as you hit a button and accidentally cut the caller off. How to change paper roll in fax machine, if you are still using one at these really high tech times? How to change the ink cartridge of my printer? Yes, the printer will not work unless all cartridges are installed properly. Let's hit the button, and let's be patient for 90 seconds or so, and then - hopefully... . Instructions and manuals looked like blueprints for an air plane construction. Have you ever studied how we use our high tech appliances? Our modern homes are filled up with sophisticated gadgets that are rarely used to their full potential because they are simply too complicated to operate. A good friend of mine confessed just yesterday: "I am still ignorant on computers. 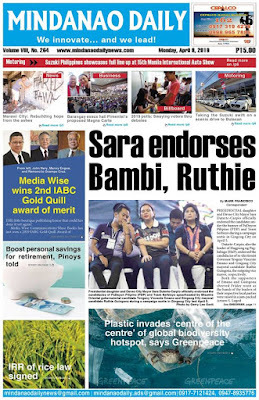 Just let me ride a carabao, and I am more comfortable rather than touching computers!" We buy all these machines but become frightened by the profusion of switches and buttons and operate just the basic functions. 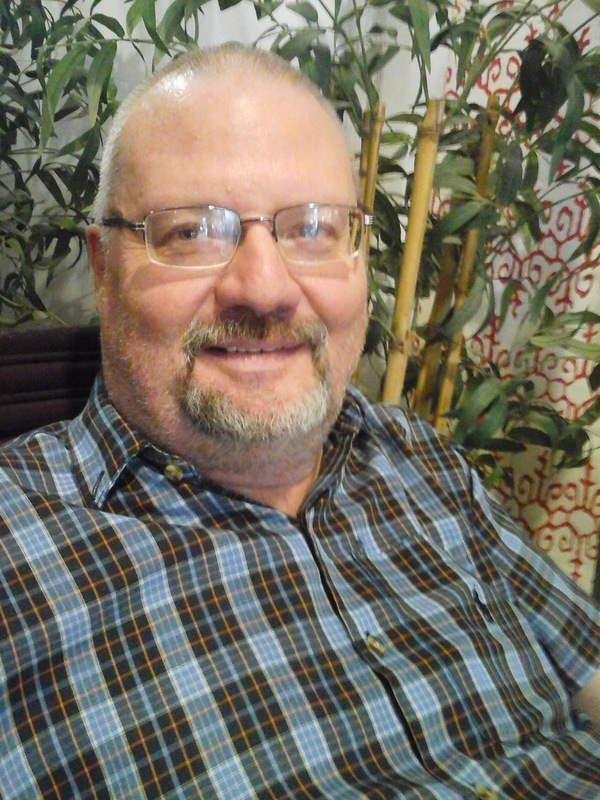 I really smiled, when I found a quotation of Donald A. Norman, former head of the Department of Cognitive Science at the University of California, San Diego regarding his new digital watch: "You would need an engineering degree to work this. Well, I have an engineering degree. Give me a few hours, and I can figure out this watch. But why should it takes hours?" Good question, Sir. Norman and also Charles Owen, former professor at the Illinois Institute of Technology fault manufactures for largely ignoring consumers. Instruction manuals are written almost as an afterthought instead of being translated into plain language. Sorry, up to this moment high tech still gets me down! And I am pretty sure, I am not alone with this problem... .
Hi everyone! 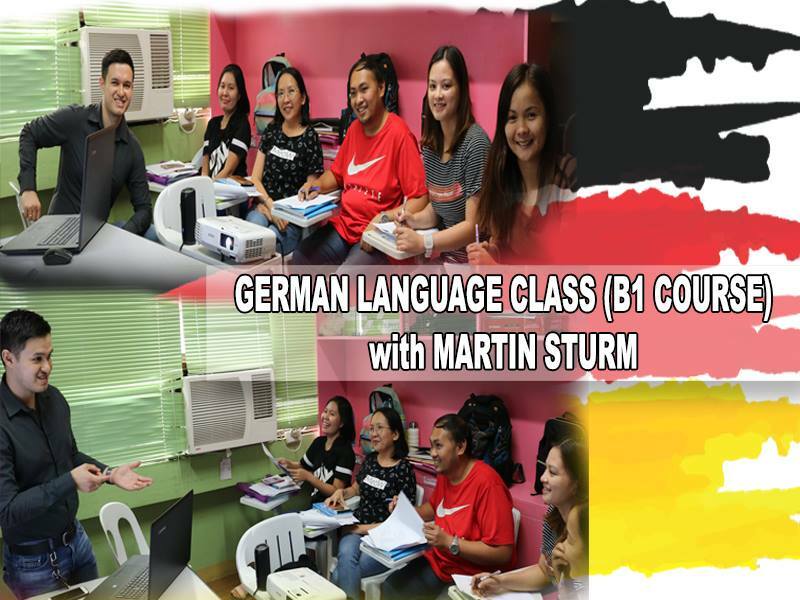 Are you looking for the best German Language school in Davao ? ... so you must lie on it! Well, I remember, how many times I started to whine,when I had to go to bed. Still being as happy as a sand boy, I only got one thing in mind. Stay up, stay up...! My eyes became already quadrangular because of terrible tiredness, but, I didn't care! Adults life at night must be really mysterious - and, we kids shouldn't be with them any time. Tears, screaming, up to six or even ore times getting up, running to the living room, where they are still gathering together and enjoy... .
Every night - yes, but the most worst has been the so-called (?) "siesta", actually just another interruption of games and fun. During those times, at the second half of my life, am I happy having the chance to take a nap - especially during weekends. While being still young (? ), we actually don't need a bed. The bed is just only used to cry out our love-sicknesses - and later, to share again with a loved-one. Then, the bed suddenly changed. It became a simple floor mattress while getting a massage to cure the terrible back pain. I also remember an extendable couch and all those stupid ceremonious constructions such as "futon" or "water-bed"! And then? Here we are in our special health bed with body friendly mattress and adjustable bed construction. Hey, if I only could lie down earlier...! And then? We're lying in our luxurious unit, called bed, and we can't fall asleep because all thoughts of the day harass, bother and haunt us. We roll from one side to another and start counting stupid sheep: 898, 899, 900, 901 - sleep NA LANG!) - or continue counting... . Sometimes, I envy Leonarda da Vinci - Italian painter, scholar and technician, 1452-1519), who only needed 15 minutes sleep (but every four hours). On the other hand, German physicist Albert Einstein (1879-1955) needed to sleep 12 full hours daily being able - as he said - to think and probably change the world. Yes, if, we become sick and had to stay in bed, we might start hating it - no wonder! And our death-bed might become one of the wonderful clouds in heaven... .
Our attitude regarding a - or - our bed changes from time to time, but the bed remains as what it is: a bed. A bed in every apartment, in every house, in every hotel room or in every guest room in our house. Everything, the world may change, but there will be always a bed, which lures and tempts, waits and threatens. Our bed, a flight and escape castle, a safe and secure place. If we only would have known this at the age of 5 or 6 or so... ! 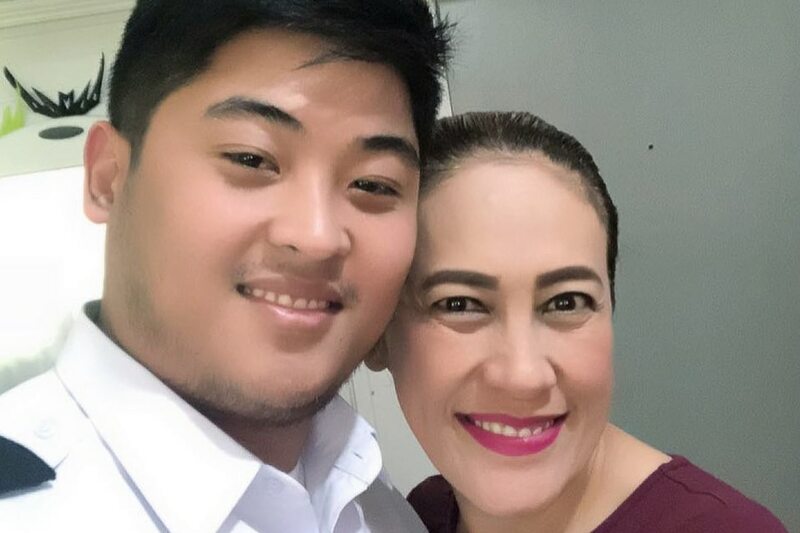 Ai Ai delas Alas believes it’s about time stories about older women in relationships reach mainstream popularity, so the viral hit that was the trailer of “Glorious” was welcomed by the screen veteran, herself with a partner decades her junior. 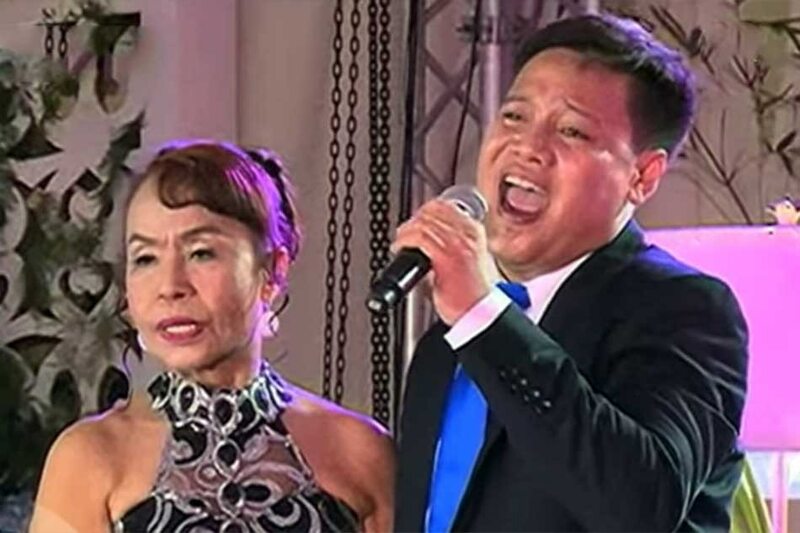 Delas Alas is nearly 54, while her husband, Gerald Sibayan, is turning 25 this month, making their age gap nearly three decades. 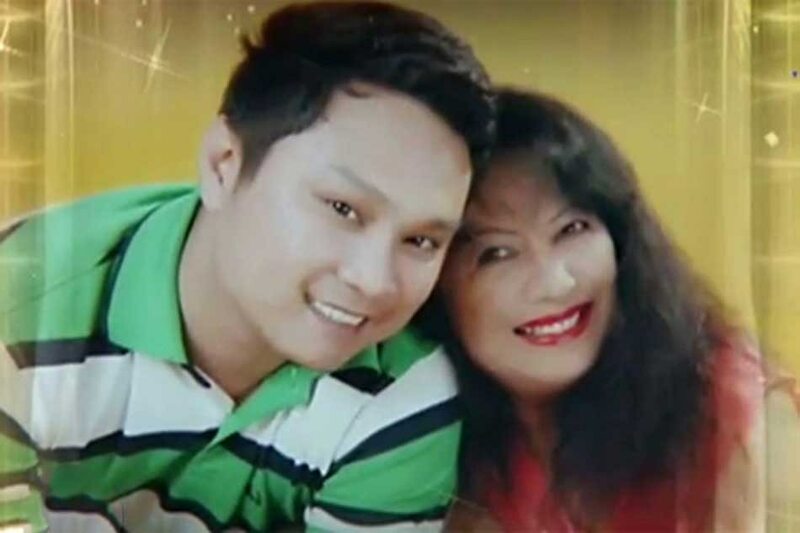 A similar situation is portrayed in “Glorious,” starring Angel Aquino and Tony Labrusca — one of the first original movies made for ABS-CBN’s revamped iWant streaming service. 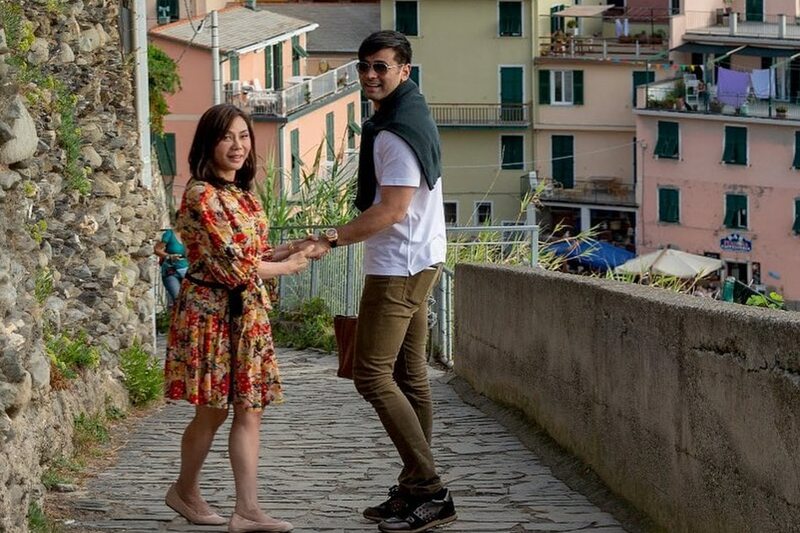 In one of the scenes shown in the trailer, the characters of Aquino and Labrusca openly discuss how outsiders perceive their relationship, including that it’s about leeching off the older woman. They agree that’s not the case. Klaus Döring's Classical Music/Klaus Döring's Klassische Musik: We've worked out John Williams' secret ...: ... to starting a great melody, and it's unbelievably simple Is this John Williams' secret ingredient? 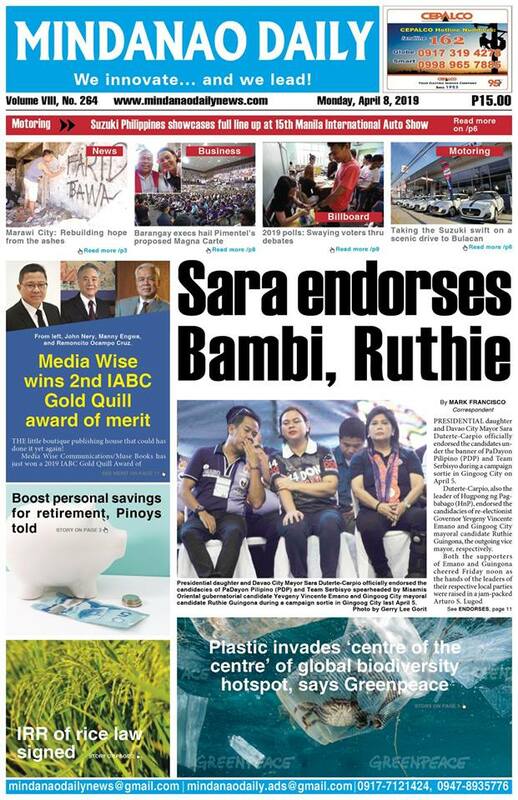 My column in Businessweek Mindanao and Mindanao Daily News. Honestly, the environment and climate change matters me most. Watching the daily news and the never ending horror stories about killing thousands of people due to natural disasters make me sad and sometimes helpless. Is it already too late? The UN panel on climate change has warned that governments worldwide must act fast if the impact of global warming is to be limited at a manageable cost. Its annual report will form the basis for a global climate deal "as soon as possible". Governments will have to reduce greenhouse emissions to zero by 2100 if the impact of climate change is to be kept in check at an affordable cost, a United Nations report said last Sunday. Such reports are not new. Only the dates are being changed year by year! Anyway, if rapid steps were not taken to cut the emissions, however, the price could rise considerably, it said, warning that a failure to curb global warming by the end of the 21st century "will bring high risks of severe, widespread and irreversible impacts globally." I am not an expert, but allow me to question if it will be really at the end of the 21st century? Such an "irreversible impact" would occur, for example, if Greenland's vast ice sheets were to melt, which could result in the swamping of coastal regions and cities. It's melting already. Please check out my last week's column in this publication. The effects of climate change were already evident in an increase in extremes of heat, heavy rainfall, the acidification of the world's oceans and a rise in sea levels. According to the report released by the Intergovernmental Panel of Climate Change (IPCC), the cost of reducing carbon-dioxide emissions in the short term would not brake global growth to any great degree. It said annual projected growth of 1.6 to 3.0 percent a year in consumption of goods and services would be cut by just 0.06 of a percentage point per year if immediate action were taken. The report is a 40-page synthesis summing up 5,000 pages of climate change studies already published since September 2013. The studies establish with 95-percent certainty that almost all global warming seen since the 1950's is man-made. Imagine - since the 1950's!!! The document, which has been edited by officials from more than 120 governments meeting in the Danish capital, Copenhagen, has been furnished guidelines for a UN deal on global warming scheduled to be struck at an international summit in Paris already in late 2015. Options for limiting the amount of greenhouse gas emissions included improving energy efficiency and moving from fossil fuels to wind, solar or nuclear power, according to the study. Words of hope? What really happened since then? "We have the means to limit climate change," then IPCC chairman Rejendra Pachauri said. Yes, sure. And? "The solutions are many and allow for continued economic and human development. All we need is the will to change, which we trust will be motivated by knowledge and an understanding of the science of climate change," he added. Did our global governments understand the science of climate change? And what are the logically following steps and law implementations? 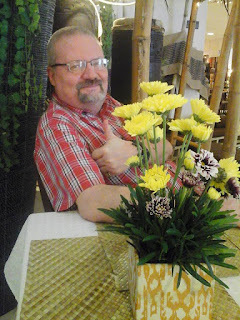 Visitors of germanexpatinthephilippines/Besucher dieser Webseite.Ich liebe meine Flaggensammlung! FALSCHE PHILIPPINISCHE DOKUMENTE? Clerical Errors in your Philippine Documents? the only certified and licensed agency based in Davao City/Mindanao/Philippines with business permit plate No. 39803. Deutsch-englische Übersetzungen/German-English translations! Dolmetscher-Dienste! Interpretation Services! Günstige Stundenpreise! Affordable charges per hour! during office hours/während der üblichen Bürozeiten from 8 am to 5 pm/von 8 bis 17 Uhr! Wir arbeiten mit allen wichtigen Behörden auf den Philippinen und in Deutschland zusammen. 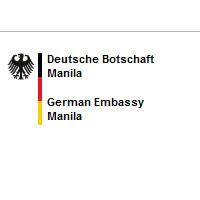 We're connected with all important Philippine and Germany authorities. Glad to be on your service! University of Southeastern Philippines, Institute of Languages, Science Bldg., 2nd fl., Room E 208. Office Hours: Mondays - Thursdays from 8 to 9:30 AM only by appointment via 082 - 227 1761 or 0915 219 9002 or davaocity@hk-diplo.de . Bürozeiten: montags bis donnerstags von 8 bis 9:30 Uhr nur nach Terminvereinbarung via 082 - 227 1761 oder 0915 - 219 9002 oder davaocity@hk-diplo.de . that the consulate will be closed on April 9 and April 15 - 19, 2019 (during the Holy Week). daß das Konsulat am 9. April und während der gesamten Karwoche (15.4. - 19.4.2019) geschlossen sein wird. I'm Klaus Döring, German Honorary Consul for Mindanao/Philippines, journalist and businessman by trade, an expatriate living in the Philippines for good since 1999. 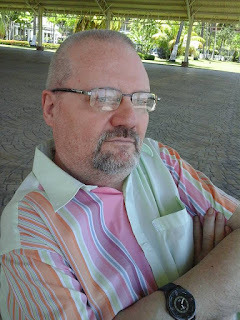 I was a radio host in the Philippines (before together with radio rebroadcast-partner DEUTSCHE WELLE RADIO) with shows such as "The Passion of Music" and "Classics at Night", Professor for German Language at state university in Davao, court certified and by German, Swiss and Austrian Embassy in Manila listed translator and interpreter. 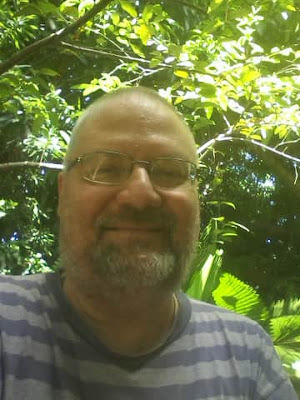 - Ich bin Klaus Döring - deutscher Honorarkonsul Mindanao/Philippinen, Journalist, Geschäftsmann und früher Radiomoderator auf den Philippinen ( zusammen mit der Deutschen Welle). Ich bin ausserdem Professor fuer Deutsch am Fremdspracheninsitut der University of Southeastern Philippines sowie gerichtlich zertifizierter und von der Deutschen, Schweizerischen und Österreichischen Botschaft in Manila listierter Dolmetscher und Übersetzer. DO YOU NEED HELP IN THE IMMIGRATION? PROBLEMS THERE? YONNEX - Translation and Documentation Services, Inc.
is the only registered agency with license in Davao City - Business Permit Plate No. 39803! during office hours / während der üblichen Bürozeiten from 8 to 5 PM/von 8 bis 17 Uhr. Brauchen Sie Hilfe? Haben Sie Probleme bei der philippinischen Immigration? YONNEX Translation and Documentation Services, Inc.
- die einzige lizensierte Agentur mit Sitz in Davao City (Business Permit Plate No. 39803) HILFT!!! Wir arbeiten mit dem Bureau of Immigration and Deportation zusammen! WAS ANDERE VERSPRECHEN UND NICHT HALTEN KÖNNEN - WIR KÖNNEN ES! during office hours - während der üblichen Bürozeiten from 8 AM to 5 PM - von 8 - 17 Uhr! My Mindanao - Mein Mindanao!